Regency was my first love as a romance reader. I was a late bloomer on the whole romance thing. I’d always adored any kind of period drama on TV or at the movies and I worshiped at the feet of Jane Austen, but somehow I hadn’t discovered romance novels. I stumbled into them when someone gave me a contemporary one as a joke (the heroine had a lot in common with me). It wasn’t very good, but it must have sparked something in me because I took myself to the library to check out the romance section. And OH MY GOD, PEOPLE. I devoured anything historical I could find there, but there was something about Regencies in particular that kept me coming back. I think it was the delicious tension of a love story unfolding within the social restrictions of early 19th-century society. And yet they weren’t the restrictions of the Victorians. Our un-corseted Regency misses actually had a degree of freedom that subsequent generations would not. It was a sweet spot I adored. So when I decided to try my hand at writing, of course it was in the Regency sub-genre. 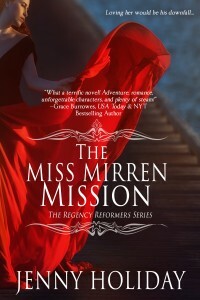 I wrote The Miss Mirren Mission (and sold it) before I ever had any inkling that I’d be a contemporary romance writer, too. In fact, I had my Regency blinders so firmly on that when I went to my first Romance Writers of America conference a couple years ago, I was embarrassed at how out of the loop I was. Not only had I read none of the books by the keynote speakers, I hadn’t even heard of these writers. Fast forward a little, and I was having a conversation with my agent about the market. She suggested I try writing a contemporary. I was a little taken aback. I couldn’t write something that wasn’t set in the 19th century? Could I? That was crazy talk. Wasn’t it? Hee hee hee. That conversation resulted in Saving the CEO, book 1 in my 49th Floor Series. And because of the way the publication scheduling worked, it and book 2 in that series came out before my Regency series started. Pretty soon I found myself being invited to guest blog at places like Just Contemporary Romance. I was an accidental contemporary romance novelist. What can I say? It was a slippery slope. But Regencies, they were definitely my gateway drug.